According to a HSBC study that was released today (9 Jun), Singaporean parents on average spend $21,000 a year to fund their children’s higher education. 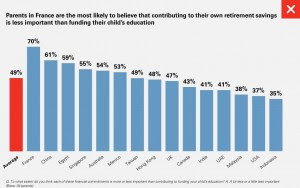 The study, which covered 6200 people across 13 countries, also showed that 52% of parents in Singapore would be willing to go into debt to fund their children’s university education and more than half prioritize their children’s education over their own retirement. While results of this study were not met with any drastic response from the public, costs of education have caused quite a stir back in 2012. After a Parliamentary question by then-NCMP Yee Jenn Jong, it was revealed in Parliament that the government spends $36 million a year on scholarships to foreigners. Excluding tuition grants, some estimates have placed the total amount at as much as $400 million per annum. While the number has since reduced because of political pressure, it would seem that there are still a large number of foreigners within the local universities while two-third of poly graduates are forced to go overseas or to private universities to further their education. Earlier in May, Leong Sze Hian estimated the percentage of non-locals in Singapore’s local universities to be 42%. Are you one of the 52%? This article was first published over at TR Emeritus on 9 June 2016. It is reproduced with permission. UniSIM student: Can I pay just half of the school fees?